2. What three criteria must be fulfilled in order for something to burn? 3. What is autoignition temperature? 4. When the fire is on – what is almost always created? 8. Connection between photosynthesis, cellular respiration, combustion? 9. What three ways are there to extinguish a fire? Fire is a chemical reaction between a combustible substance and oxygen. In order for the combustible substance to burn, the temperature must also reach a certain ignition temperature. Wood begins to burn at 300 °C and hydrogen at approx. 510 oC. The reaction energy is radiated out to the surroundings as visible light and as heat radiation (heat). What three criteria must be fulfilled in order for something to burn? To make it burn three criteria must be met. There must be a combustible substance (eg. wood), there must be oxygen and also a certain temperature must be reached before it starts to burn. All is summarized in the below “fire triangle”. If anything is missing in the fire triangle it will not burn. The autoignition temperature is the temperature the combustible substance must have to start burning. When the fire is on – what is almost always created? When it burns almost always is created carbon dioxide and water. At the same time heat radiation is emitted, released (energy). The cellular respiration reaction takes place continuously in our body. We eat e.g. spaghetti containing glucose molecules as small spirals called starch. The starch is cut into free glucose molecules by our digestion. These glucose molecules are absorbed by our small intestinal wall and are transported through our blood stream to our cells. Here the glucose is used as energy. At a temperature of only 37 °C the glucose converts into energy by our cells. In order for the reaction to happen it requires certain enzymes in the cells. These enzymes make the reaction occur already at a temperature as low as 37 oC. The energy is released as heat and high energy molecules (ATP molecules). 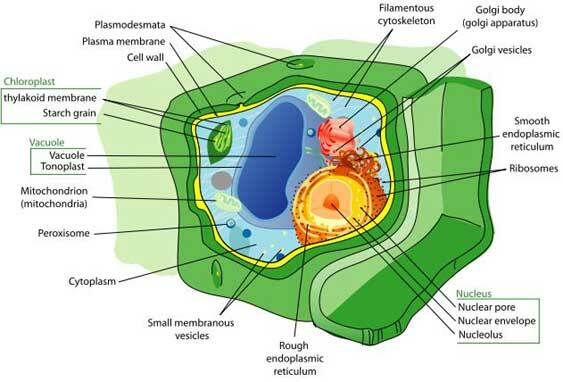 Below is the reaction that occurs in the cells. Note that the waste products are carbon dioxide, water and energy. The combustion reaction for glucose is exactly the same reaction as the cellular respiration reaction above. The difference is that the combustion reaction occurs at higher temperature. 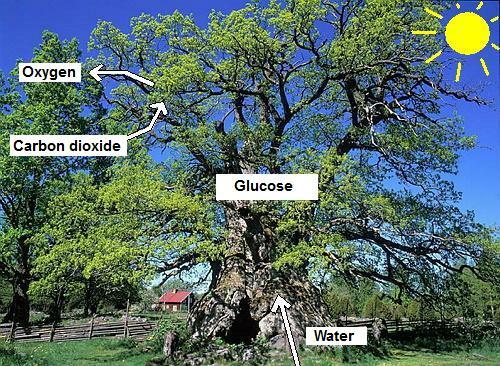 When glucose molecules are joined to form cellulose building up tree trunks (wood), the temperature needs to be as high as approximately 300 °C before the reaction starts, i.e. before it starts to burn. Apparently, the plants need carbon dioxide, water and sunlight (energy) in order to produce oxygen. At the same time glucose is created. The glucose is used for the construction of the tree or plant. The glucose is used to build up leaves, stems but also the fruits. Trees / plants / shrubs that grow can put together glucose molecules into starch or cellulose. A plant can use glucose to form starch (potato, wheat, root crops). A giant starch molecule has about 300-400 glucose molecules joined together in a row as a spiral. Cellulose is made up of glucose molecules joined together in rows as long fibers. The number of glucose molecules joined in a row is about 1000-1200 pieces. Cellulose builds for examples the tree-trunk and other plant parts. Connection between photosynthesis, cellular respiration, combustion? These two reactions are opposites. We humans (or animals) cannot live without green plants and green plants cannot live without animals. Look at the reactions then you'll see that photosynthesis emits oxygen that humans and animals need for their respiration. The oxygen is needed for the cellular respiration reaction. What three ways are there to extinguish a fire? If only one of the three things is taken away from the fire triangle the fire goes out. 2. Take away the heat by cooling the fuel with e.g. water. 3. Oxygen can be removed by excluding oxygen (veiling it). If for example oil is burning in a pan on the stove, you can put on the lid. The oxygen under the cover is consumed in the combustion reaction and then the fire goes out. Other situations may require so-called fire blanket laid over the fire veiling off oxygen until the fire "suffocates". Question: How can we remove the above parts from the fire triangle to stop the cellular respiration reaction to occur in our cells? This is the temperature reached when a substance releases flammable gases. Gasoline emits flammable gases already at -28 oC. So even when it is winter and -28 °C a lit cigarette ignites gasoline gas that has accidentally been released from a gas station. In cases 1 and 2 (both graphs), energy is consumed to make the reaction occur. This energy EA is called activation energy. The hill (EA) represents the barrier to overcome for the reaction to take place. When the hill is passed, the energy is released. When the energy released is greater than the activation energy, the reaction is exothermic. Considering the whole reaction, there is more energy released than consumed in the reaction. Energy is released. Examples of such reactions are the cellular respiration reaction or the combustion reaction. Excess cellular respiration energy in our body is re-coupled to the reaction making the body having a temperature of about 37 oC, and for the creation of ATP-molecules. The reaction can continue. Excess energy in a combustion reaction is used as activation energy, and some radiates as heat energy and visible light. In case 2, the energy that is released is less than the activation energy for the reaction. Such a reaction is called an endothermic reaction. Therefore, energy needs all the time to be supplied to the reaction for it to take place. An example of such a reaction is the photosynthesis reaction. The sun supplies energy during the day.